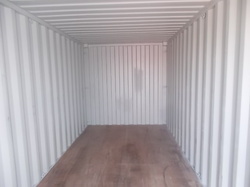 Pioneers in the industry, we offer iicl grade used shipping containers from India. With years of experience in the domain, our firm is instrumental in offering a comprehensive array of IICL Grade Used Shipping Containers. These containers are demanded by various industries for safe, secure, and efficient transportation of goods and other materials. Our skilled and hardworking personnel design these containers by using innovative technology and premium quality components sourced from the reliable vendors of the industry. We check our products on various quality measures before delivery. Furthermore, Customers can get it at pocket-friendly rates.